. : In English part 18 :. ENGLISH DIARY, Part 18, starting Monday 2nd November 2015. 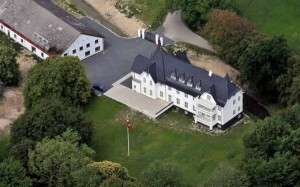 Groengroeft Castle in South Jutland is for sale for 15 million kroner. It was completely renovated in 2009. The right price is actually 22.5 milion but nobody at all has shown any interest. Even after the price was lowered by 7.5 million, so the price is now a trifle of what it should be and it could probably be lower yet. Could be a bargain. I shall buy the castle. You will organize a nationwide fundraising for my project. Whoever collects the most money will get a week's fully paid stay at the castle towards helping keep the park and vacuum cleaning inside. Both are activities I like being rid of. So just get started. I shall gladly send you the account number to use. I just want to tell that Matron bakes a very good black bread, a loaf which is widely praised among family and friends. I am not the one to contradict for it is really good. At the same time I am a little proud og being involved in the process. It is I who stir. It's hard work. We do not have a machine that is nearly strong enough to do the job. So with raw muscle power I do it. It hurts in my shoulder. It takes some time, but bravely I soldier on because I know what I shall have for my lunch tomorrow. I'm looking forward. I can only recommend the bread. What is better? What's nicer? Here comes the better and more pleasant. 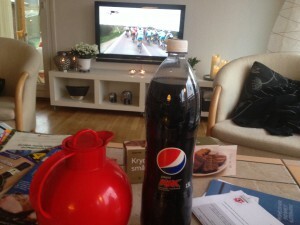 On TV, I am watching a great cycling race from Italy, with many of the big names. I follow it while I am eating a biscuit and drinking some tea or Pepsi Diet. I sink deep down in the sofa and feel warm and dry. And it's Saturday. What more could one ask for? I do not know. I am very well. 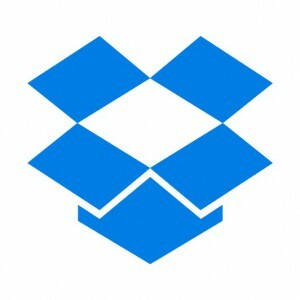 I then will not deny that I have heard the word "Dropbox" before. But it has never interested me to find out what it is. From Silkeborg Archive, I was sent 15-20 images for my book on precisely Dropbox. And there I sat with my lack of talent and could not do much. Man, I was fed up with it. I had to experiment. I searched here, I searched there , I clicked here and I clicked there. No luck. I could not download the damn thing. Two hours later I finally succeeded. I dare hardly mention that it was even more difficult to copy the images into my book. But now I told it anyway. After 4½ hours, I was happy. It's good to be happy. I heard my dad's voice today. Well, well. Do not worry. There is neither any occult nor any other sorceries about it. Not at all. I went for a walk and suddenly remembered my father saying, "Lift your feet". "The voice" was recognizable and I remember it clearly from when, as a child, I walked with him, and I happened to drag my feet on the ground. And that's what I did today. Suddenly I noticed it. I have my own slightly stooping walking style which easily causes my feet to drag. I have not thought about it until today. When I tried - and successfully so - to lift my feet as I walked along I most definitely could increase speed and my back hurt less. Today, exactly 59 years ago - a Saturday - I got a girlfriend. I knew her a bit in advance. But now I know her a lot better. Her name is Else. It all started at a dance in Silkeborg Sports Club. It was Saturday, March 2nd, 1957. I was and am very shy but I nevertheless walked her home when she left the party. I believe she asked me. Otherwise I would not have done it. It was great. I thought it would never happen to me that I should take a girl home. And I got a kiss for it - or was it two? Since we have been together. She's a good girl. 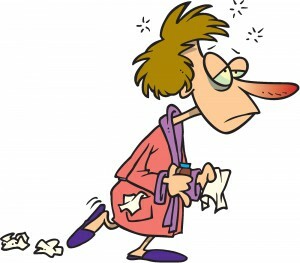 Somehow I managed to catch a cold. It is not of recent date. In fact, it has ravaged my muscular body for just over a week. It is not satisfactory but worst of all is the incurable. Any doctor would tell you that. Therefore, I am considering the following: A hot bath, really hot, boiling hot. Duration: fifteen minutes. Next - wearing only a pair of thin nickers - I shall stand in the biting frost on our fine terrace for half an hour. No doubt I shall I get pneumonia. That can be cured. A cold can't. It's quite stressful that you can not go into your bank and deposit money, you know real money, round and square. It is only in a very few banks you can do it. I laugh at the paradox of a "cashless bank". The actual cause of my frustration: Matron has for the last year made a point of checking all receipts from all supermarkets. Any overpayment she has obviously been paid back and has put all of the money 743 kroners, in a little box. It was that money we wanted to put in the bank. Therefore, we had to drive to Aarhus. A long way. Well, never mind. Then I could buy can of ointment for my somewhat battered buttocks after yesterday's bike ride. You can only buy that in Aarhus as well. On our way home we visited 3 supermarkets, a second hand shop and a furniture shop. Finally it came. The first ride on my bike this year. It was made extra nice by the fact that it was with daughter Annette who called and asked if we shouldn't ride together. And we certainly should. It's always good to ride with her, also because she is kind to wait for me and she is happy to give a push up a hill. But first of all I like the idea that I am riding with my sweet daughter. We started out in nice, almost warm, sunny weather. But then came the fog and it became bitterly cold. It felt like a drop in temperature of 10-12 degrees. We froze deep down into our bones when we got home. However - a nice ride that I would very much like to have repeated. It has started. The first major bike race in Europe this year was today - in Belgium - and I have followed it closely on TV, apart from a single "drop out" or two, when my chin fell down on my chest. It's great to see the big names again and my friend Martin Mortensen also was there albeit he was not seen a lot. Only one little glimpse. But the season has started. Meanwhile, my daughter and son-in-law were out and rode a good distance on their racers. And also my brother was out. And here I sit not having done even 1 meter - have not been on my bike since Nov. 7th, the longest pause I've ever had. It is not good. One can say it did not make me smile. We were in Silkeborg today. Partly to visit the cemetery where everything breathed peace and tranquility. No one was up. 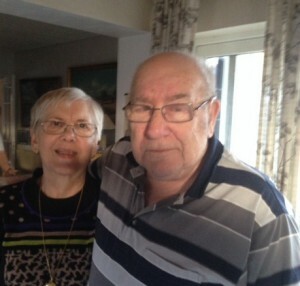 But primarily we were there to see family, sister in law Grethe and brother in law Finn. They are very nice people of whom a lot of good can be told. 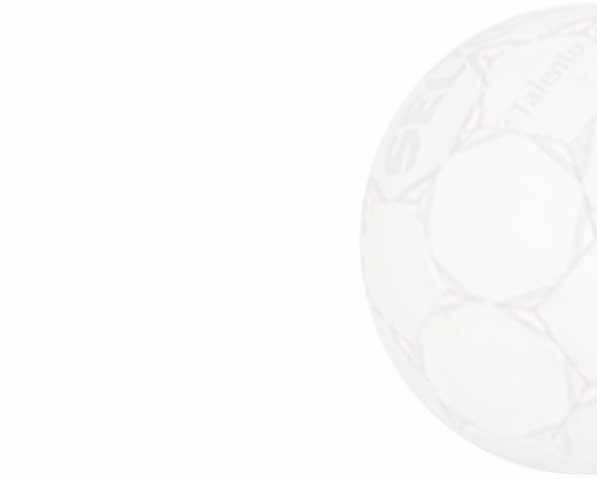 This time I will concentrate on their common interest Silkeborg Sportsclub (SIF). They have both been involved in many, many years. 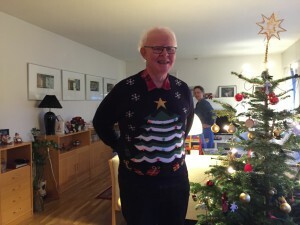 I think that Finn is the one person in Denmark with the longest career as a manager, department chairman, board member, coach and much more in a sports club. 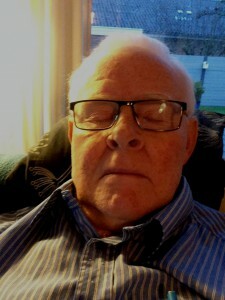 Just about 70 years and he is still deeply involved in the club. It must be Denmark record, and of course, he is an honorary member. I bow in deep respect for everything he has done. Next year the club will be 100 years and also in that Finn is deeply engaged. He is fantastic. Well well. 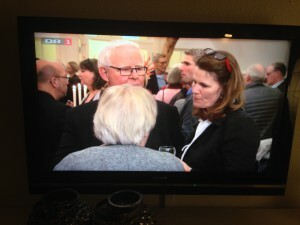 Once again one was on national TV, it was last night at DR1, prime time. Last time was in 1998. So viewers must have got used to me. Matron and I were seen in a cut of yesterday's broadcast "Landlords" in conversation with Anne Sophie Gamborg owner of Moellerup Estate together with her husband Stig. We were there to see and hear a Christmas concert. It was some time in November. A very good concert. 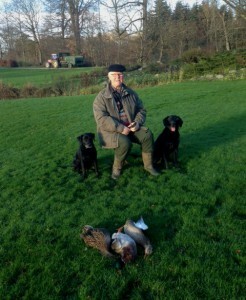 I have known Anne Sophie since she was 12 years old from the many hunts I have been on at the estate. She is a very active woman. Watch carefully next summer, on July 15th. 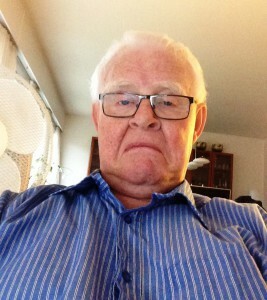 Then oldest granddaughter Katrine and I will attend the "World Ballet", also at Moellerup - also with TV coverage. I ought to have a fee soon. At a distance I have followed the later days' excitement about which restaurants in Denmark would be awarded Michelin stars. It has gone quite well, the press tells. Many stars were awarded today. One restaurant has even got three of them. I'm sure it's to the delight in that particular restaurant. Respect for it. If I can feel happy about it, is another matter. I'm afraid that I care more for some "solid" meals. I am not able to rejoice in what is called "Haute Cuisine", and in particular I am not satisfied that I am still hungry after the meal. I've tried a few times. No, may I ask for Matron's cooking. She makes good and tasty food and you are not afraid to ask for an extra helping. A zero day, a non-day, a stupid day. I have not been on my toes today. In other words, a bad day. And I even walked six kilometers out into the great outdoors. Can it get much worse? Do not think so. Hello and joy, we live with grief in mind. Well, never mind. I have high hopes that tomorrow will be a better day. 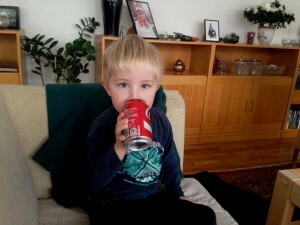 The highlight of today will be that tonight we shall go out and take care of little Frederik. It makes a sad day brighter. I am looking forward for tomorrow. In case you want a new job I want to draw your attention to a job advertisement from NASA. 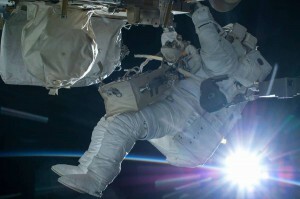 They want new astronauts. I assume the ad can be seen at the employment office. However you should not wait too long since 18,300 men and women have already applied. Between 8 and 14 will be hired. Of course I'm going to send an application myself because I have not found anything about age restrictions. However, I would make the condition that I will not go in the hunting season and that there must be an exercise bike on board. They are modest conditions. I promise to send postcards when I am hangimg out there. It was a good bargain - and I bought Matron's birthday present at the same time although there are a few months till the big event. For a long time my good wife has wished another side piece for our sun shade on the caravan. I have pulled the breaks a bit because it is a bit expensive and because it's I who must put it up. But when the good lady found out that a caravan store in the south west of Aarhus had a sale on such items I had to surrender and go off with her to get hold of a side piece. We got it for half price and Matron promised that she would put it up. It's probably naive to believe it. But she was so happy. It was my exercise bike which today was the victim of my physical activities. But they were not many. I was so bad that I shall not humiliate myself by telling about time and length. It was embaaaaaarising. Only so much I shall tell. It was with the utmost difficulty I got my pulse over 100. 101 to be exact. There has to be changes if I want to get a decent start to the cycling season. And a poor start will rub off on the rest of the year. It was clearly seen last year which was a great disappointment. What a lot of miseries. Instead I shall rejoice over the fact that the length of the day has increased by just about three hours. It is going forward towards brighter times. I need that. To walk is to hold doomsday upon oneself. There is time to curse and swear over one's own folly to venture out on a walk of more than 4 kilometers as I did today. 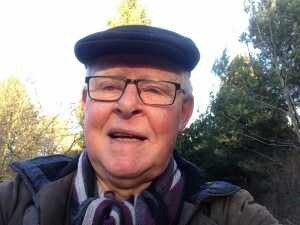 If it was not because someone has made me believe that it is healthy and a good way to lose weight I should never have started on the long string of walks I now has achieved. I approximately walk every second day. The walks are from 1½ to 5 km. Well yes. At least the dogs seem to like it. The are apparently not so bored as I am. On the contrary. And they do not get sore hips. Matron had an appointment at her physiotherapist in Hornslet today. Her back hurts, and it is very painful. With usual generosity, I offered to drive her. That's just how I am. When we were about 200 meters from the clinic the sweet lady got a call. It was the therapist who just wanted to tell that unfortunately it could only be at 5 p.m. Unfortunately she had made a double-booking. And there we sat looking at the clinic. That made me angry and I remembered the last time - it was last week - the physiotherapist had completely forgotten that we should. So we sat idly in the waiting room for half an hour till we found her in the building. I do not like physiotherapists who forget their appointments. Late in the afternoon my brother called and told that he was enormously busy at work. He sounded quite overwhelmed. 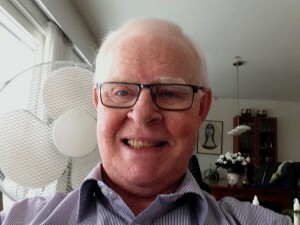 Therefore, he asked if I could translate an article from Norwegian to Danish for him, about language learning, five A-4 pages. Quite a lot. Preferably at once. I have reluctantly realized that I am becoming worse and worse to handle sudden changes in my daily pattern so I was concerned if I could reach it. Moreover, my Norwegian is pretty rusty. But then I decided to myself that it can not be true that a young man like me has so negatively. So I hastened to say "Come on". He sent the article and immediately I started. It took 2½-3 hours and it was not nearly as difficult as I feared. From all that I learned that I can pull myself together. It is good to know but never tell Matron. One of my favorite pastimes is going to a museum with grandchildren. 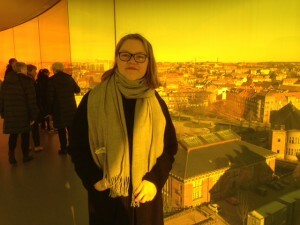 Today Cecilie and I went to AROS, the big art gallery, and had some good experiences, in particular two. Cecilie studies Chinese at school and could therefore tell me much about the Chinese exhibition "A New Dynasty - Created in China". In particular, we enjoyed a video collage by a Chinese artist. I learned a lot from Cecilie when we saw it. 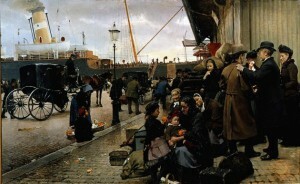 The next good experience was the classic painting from 1890, "Emigrants at Larsens Square". We never go past that painting without stopping to talk about the time then, about reasons for emigration and about the people in the painting. It's moving. It was a good day, and I walked almost as much as yesterday when I walked five kilometers. Try to understand my sufferings. Today "Channel TV2 Charlie" completed "Heartbeat". 372 episodes are once again over - and that for the 11th time. I could not escape watching episode 372 and a small "Thank God" came over my lips when it was all over and a quiet joy spread. Matron usually watches 2 episodes per day, approximately 2 hours. It is bad. Now it was all over. I rejoiced too early. It was announced that the series will start again tomorrow, with the modification though that from now on only 1 episode per day. Consequence. 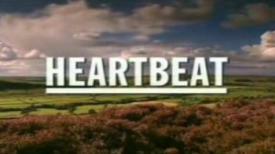 The next year + 6 days, I shall be watching "Heartbeat" - if I want to be in the living room. And that for the 12th time. Within a very short time they shall come - all of them, children, in-laws and grandchildren - with one exception who is visiting his girlfriend in Odense. Then there will be talking, playing and maybe a walk to the beach which all of them love. And then something to eat. Very little makes me more happy than when they are all here. It gives pleasant little bubbles in my stomach and a relaxed feeling in other parts of my body. And there are plenty of them. Our once so beautifully decorated Christmas tree has, since Boxing Day spent its days in the garden. The last line reads: "The boys were playing in the yard, and the smallest had on his breast the golden star the tree had borne on its happiest evening; now it was over, and the tree was over and the story was over, over, over, like all stories will be!" Quite the same fate, our tree nas not yet suffered. On the contrary, it has been around and see the whole garden. The severe storms gave the tree trip around. Now it is at rest, waiting for its last trip to the recycling center - without any hope of being used again, though. The first Christmas lunch is over. Not a moment too soon, if you want to reach all of them before it's too late in December. We have just returned from the lavish party, I in an lightly irrigated condition, in a good mood but far from that it will give me a hangover tomorrow. And that I appreciate. Neither have I eaten too much since I avoided any contact with bread. It gave the opportunity of tasting everything - some of it even twice. In particular, the extremely fine plaice, made on-site by an expert from Frederikshavn was good. Yummie yummie. For some time, my sweet wife and I have been looking for another sofa bed for our guest room. I have even been in IKEA. That was bad. But then Matron got the fine idea that we should pay a visit to a Church furniture recycling shop. And there was exactly what we wanted. A classic sofa bed with comfortable suspensions and many times easier to open and close. The price? 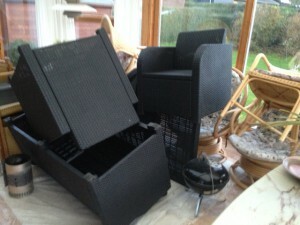 900 kroner + 100 kroner for having it delivered by three elderly, strong men. That 100 kroner is the best money I've spent for a long time. 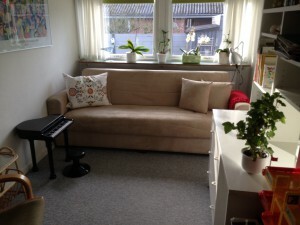 Not only the sofa was delivered but also the three of them helped getting the old sofa out and the new one in. This latter task looked insolvable. We're talking about a large and heavy piece of furniture - and narrow doors. 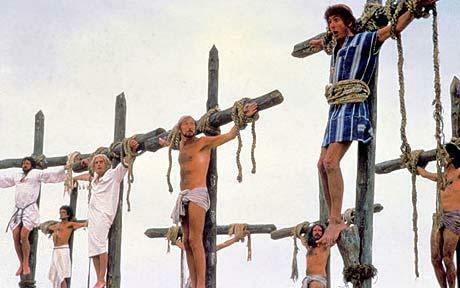 The three toiled and toiled - and suddenly it was in place. We had never done it on our own, never. Such a fine help had not been given by the well known, larger shops. So I gladly recommend the above mentioned furniture recycling shop. Completely on my own initiative I cleaned up up in my workshop today. I am still not quite sure what came over me but suddenly my steps were directed towards it and as if in a trance I started the quite big job. I was not thinking about what I had started but as I gradually got the mess removed it dawned on me. It was big. 1½ hours it took but then the place was immaculous. Just look at the pictures then and now. Should this urge come back again some other time I shall sit down in a corner until it goes away. 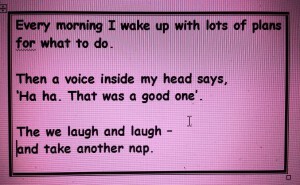 I was scolded by Matron this morning, she really had words with me - strong words. And that only because I refused to get up early and walk with the dogs. I told it to her in no uncertain terms. That definitely did not suit the good lady either. I then happened to remember our guests yesterday had told us that now you can be separated via the Internet. Just a few entries and it was done. It reminded the good lady about it and said that perhaps she sould be a little careful about what she said and how she said it. She might be in for a change in her life. Half a minute after she entered the bedroom with my laptop and asked me to go ahead. I walked the dogs right after. Occasionally, I make the right decision. Matron claims it is rare. For 10 years, the automatic sensor in our garage has not worked. The sensor was faulty. I felt that I could easily change it and bought a new one. For some reason I regretted and asked an electrician friend if he would change it. He would very much like to. And just as well. It was not a simple job, especially because there was so little space to put the many wires in. And one should also know a bit about where to fasten them. I could not have managed either of the two. But my friend could and now it works fine and we can once again find our way out of our garage - also at night. The light turns on automatically. It cost a good lunch - and it was well deserved. Well well. I may forget things now and then. Yesterday I wrote that we were going to have friends in for lunch today. We should not. It is tomorrow which Matron, after having read my diary from yesterday, informed me about with a sort of a reproachful smile and I also sensed a hint that my memory is not quite as good as it should be. She often mentions it but I quickly forget it. However, I think it is a false claim. My memory is good. For example, I remember all the generals in the Boer War but I admit I have a little trouble remembering what I had for breakfast this morning. I also remember being at home at the right time for all meals. So it is not all that bad. I confess. I have done nothing today. Absolutely nothing. Well, I took Matron to a supermarket Skoedstrup, refueled diesel, and went home again. One can be totally out of breath thinking back on all that activity. Tomorrow will be different. We are going to have friends for lunch and I know Matron's restless activity in such cases. There will be major tasks for me, such as table setting, vacuuming and especially cooking. I am going to cut the bread. Will be a busy day. I am a member various facebook groups. A group of ancient Silkeborg. Another group, the purpose of which is to insult each other as mush as possible. A group in which everything you write will be deleted within 24 hours. But then there's also one I entered without knowing anything about the theme. It's called "Bus Historic FB". I entered it because another FB friend was there. Unlike me, he knows all about the old busses. I know nothing. But as time passed I realized that it was quite nice to see pictures of the old coaches. Mind you. I have run in some of them. The bus in the picture is too old, though. I have run in it. It is from the 1920s and very local to me. One tends to be a bit nostalgic. If I'd been subjected to the following experience I would have fainted several times. 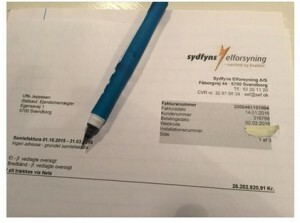 A man from Svendborg received an electricity bill from his electricity company "Sydfyns Electrification Company" of no less than 26,202,820.91 kroners. Ouch. The expenses covered even only a period of four months from October till January. When the sweat had subsided to the astonished man he put the bill aside. He was rightly confident that it was a mistake from the company. And luckily it was. His comment was simply, "Oops, my bank account will be overdrawn". Full of self-blame the manager of the company acknowledged the error. There was nothing else to do. But 6 bottles of good red wine to the unfortunate recipient of the bill would help a little. It has been a long and exhausting day. I'll take some time to get over it. Twelve hours away from home. Of these, six were spent on shopping in our neighboring country, Germania. The rest on transportation back and forth. The best consolation is that now the store with Pepsi Max is filled up. Likewise the store with various laundry and dishwashing detergents and salami - and several other items. In any case, I was pleased that most of the day was inside. My goodness it was cold outside. But please, please. Let it last a really long time until we shall be shopping in Northern Germany once again. Today we went for lunch with old dog friends. 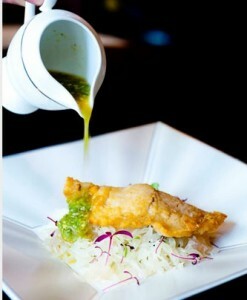 And what a lunch it was The food was absolutely perfect, well cooked and tasty to the highest mark possible. It was just what I want. I enjoyed the food and the company and I even had a couple of snapses. Perhaps it shows on the photo. There were also gifts. Again, see the picture. 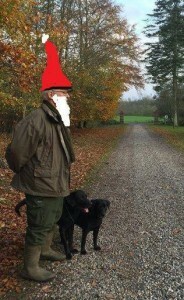 I was given a nice warm hat to protect granddad against frost and cold. It is particularly useful at my almost daily walks with the dogs in the cold and windy weather we're having. If only they recognize me. But in any case I am a handsome chap. Everybody says so. Today I was with my sweet wife for her 6 months' check at her cardiac doctor. It was a pure delight. Everything works as it should. Nothing to worry about. I even heard the doctor saying that she might exert herself if needed. So perhaps many of my duties now can change hands. I am particularly interested in getting rid of vacuuming, collection of dog poo, making beds and emptying the dishwasher. Well. To be fair. The sweet lady already works hard with all sorts of activities. She is ubiquitous and very committed to her family's welfare. I married well. I think she did too. Sort of. The last day of January. Nice. Now there's only a month until spring begins. 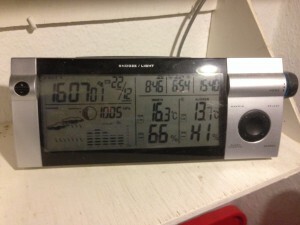 I also noticed that the day length has increased by 1 hour and 38 minutes (Sun up 8:21 and down 16:44). Yes, things are going the right way. And nothing is left to chance. It is the same year after year. Great. These are all the good signs of spring that I am looking forward to seeing unfold. And best of all. 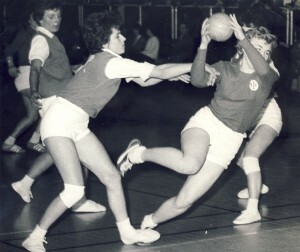 European Handball Championships end today. It has been two grueling weeks. Now I can concentrate on "Heart Beat" and Danish handball. Everything goes well, right? Another remarkable day. "For whom?" I hear you ask. 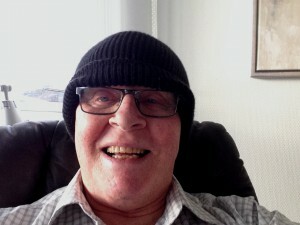 First and foremost for me because I had another good and quiet day together with granddaughter Cecilie and Matron. Remarkable because the latter two were in BILKA without spending a lot of money. 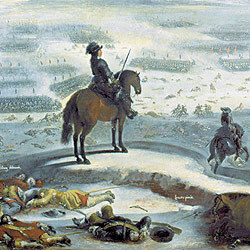 But also remarkable for Swedish King Karl Gustav who on this day in 1658 walked over over the ice with an enormous army from Funen to Sealand and Lolland. The've always been mad about ice, those Swedes. No matter how old you get you can not help following very closely what your children are doing - even if they are between 45 and 50 years old. Their concerns will easily be your concerns but fortunately it's the same with their joys. Youngest daughter has just started a new study to obtain a master's degree in communication. It is quite a big thing that requires many resources as it is parallel with her full-time job. Eldest son has just got a new job that he is looking very much forward to in a kindergarten in Skanderborg. His present job is a temporary position that will expire soon. He was fond of it but knew it would stop now. 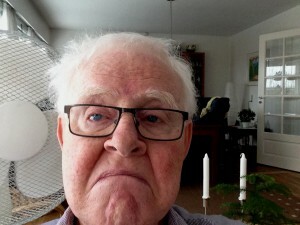 So therefore everything is joy and laughter here in Studstrup and the old man's nerves are at a minimum. A couple of years ago when IKEA in Aarhus was expanded by more than 100% I swore that I would never ever enter that building. It has always been my horror scenario of a store. The expansion made it even worse, and often when we drove past I reminded my surroundings about the invocation. But now it didn't go any longer. On the chase for a new sofa bed I had - under enormous pressure from Matron - agreed that we had to go there. However, I set the absolute condition that it was in, up to sofa beds and OUT. Nothing else. It was a pleasant surprise. It was exactly the way it went. Never before have I done a visit to IKEA in under 20 minutes. It was only a little bad to be there. There's always something to be pleased about. For many years English has had great influence on our everyday language. Just think of the number English words are used in the computer world, "download", "online". Furthermore "kitsch", "camp", "ome on", "get a room", "biker" and so on. There are thousands. And also think of TV. We are anglicised. As a former English teacher and Anglophile I don't mind too much. But sometimes it seems over the limit when "UDSALG" is described as "SALE". I could easily do without that. The same applies to a notice I saw today. Obviously a real estate agent was so happy to have sold a house, that he not only wrote "SOLGT" across the notice as is usually done. No it said "JUST SOLD". I'm happy I know a bit of English. However, a new trend is on its way. According to a study from Copenhagen University it has become smart to use German words. Now we must say "Geil", "Spitzenklasse", "Über" and "Radfahrer". I'm also happy I know a bit of German. It was cruel reading today. I read that it is exactly 29 years since Coca-Cola was named the most popular soft drink in the United States and thus pushed Pepsi Cola into second place. 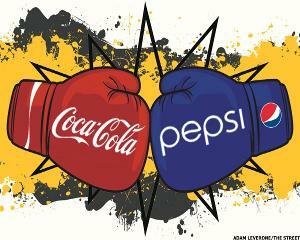 As a keen supporter of Pepsi Diet I do not understand that someone will switch from Pepsi Cola to Coca Cola. It is only simple deserters and renegates who can do that, traitors with a bad taste. Unfortunately, I have to admit that Coca Cola is still the largest compay with an annual turnover of 186 billion dollars, while Pepsi "only" has a turnover of 147 billions (2014). But that's not a quality assessment. Thank God. 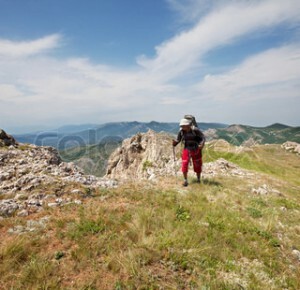 I have resumed my walks in fairly inaccessible terrain. Actually I have walked almost every day since New Year. Still they are not long, today 1.97 km. in 27 minutes. It is not impressive but worst of all. I'm bored. I will surely never be one who loves walking. But I am sure that our two dogs that always join me love it. 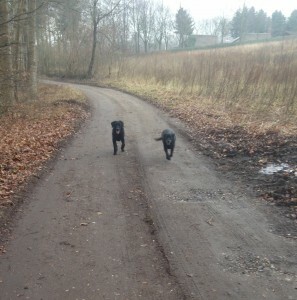 And unlike me they have no objection to the fact that the walks getting longer and longer, albeit in a slow progress. Of course the reason for my walks must be found in the fact that I don't want to bike in a weather like the present. It is both too cold and too dangerous. And I need the exercise. But who knows? Maybe I can learn to accept walking, although I doubt it. We were at a birthday brunch in Hammel today. Eldest son Peter becomes many years. He is catching up with me. When he was one year old, I was 32 times older than he. Now I'm not even twice as old. He jolly well may overtake me. 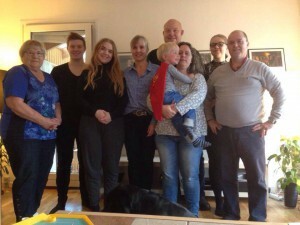 We had a very nice family-morning with nice food and a lot of good talk. Nice family. We all enjoyed it, I'm sure. It does not take much to make me happy. Just look at the difference between the two photos. Matron took scissors and electric trimmer out. I had my hair cut and immediately I was happy. It's great when it's your wife who cuts your hair. My hairstyle is exactly as she wants it. I was lucky today. I was allowed to pick up eldest daughter, Annette, on her job in Risskov and drive her home to Hornslet. But my luck did not stop here. I was also allowed to drive her to the book shop, to the supermarket and to Matas. I appreciate luck like that. Later, I was lucky enough to have to pick up Matron from her job in Aarhus. We went straight home. My luck couldn't continue. I didn't get up till 12:30. Not because I slept. I actually woke up at 9 am but kept postponing getting up. I watched a little TV, played a little Word Feud, checked a little on facebook, read a little and pondered a lot over life's small and big occurences, mostly the bigger ones. I wasn't bored, but admittedlu it might have been better to have got up. It is not good for man to be alone. 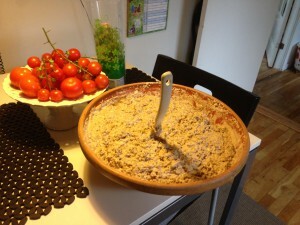 This morning brunch at eldest granddaughter Katrine in Aarhus with grandma Else. Love brunch. But probably I love more to talk to Katrine. She is knowledgeable, friendly and good to her old granddad. We have a lot of common interests. Right now it is Ludvig Holberg, a Danish poet from about 1700, although we did not talk about him today. In her studies at university, she all the time gets new impressions, and we often talk about some of them. What a day, especially when it continues with watching "Tour Downunder" on TV, bike race from Australia (recorded during the night). Then the day can only be a good one. And that's what it was. Isn't life just wonderful? I am worried and nervous and have been so all day. This morning I drove Matron to Roende where she met with some friends. 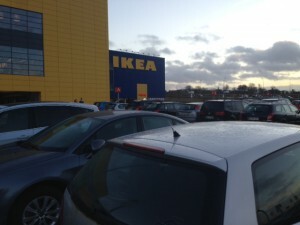 They are right now on power shopping at a shopping center in Randers. I begged her to leave her Visa card at home so I could take care of it. For what if she lost it. It did not work. Now I am sitting waiting for a phone call that I need to pick her up in Roende. I'd better remember the trailer. I'm really afraid. It is unreasonable to expose an old man for that sort of a thing. And it is even no use I say to her that I want a divorce. She just says "OK". As usual, I walked the dogs today and had an astonishing experience on the way home on the last, short bit of our small, modest street. Have a look at the photo and see how quiet it is. Only rarely you'll meet a car. And what did I experience today? On this small piece, about 100 meters, I met no fewer than two cars. Not right after each other, but at short intervals. It reminded about the M25 at peak time. Carefully and well out to the side of the street I walked the last few meters in the hope that such a shock would not recur. We might risk having traffic lights installed. God forbid. A good afternoon. 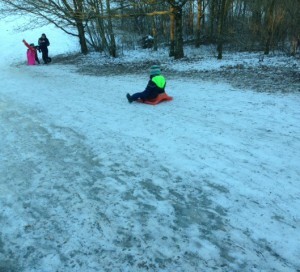 Sledging with Frederik. He loves sledging and had several tours up and down. The old man looked admiringly at the little boy who with great speed rushed downhill. I remembered when I was the same age and like Frederik loved it. I became quite envious and would really have liked to have a ride. But I had to remind myself of my age and think that maybe I could get down on the sledge and maybe I could complete the ride - with a dizzying speed because of my weight - but I would never ever be able to get upstanding again. So I remained where I was and took pictures. Well, someone must. Another memorable photo showed up at my review of old photos for my book. 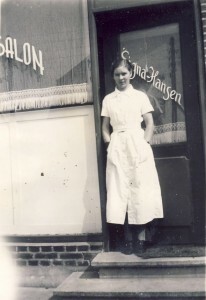 My mother posing in front of her woman hair dresser. The picture is from 1938 when she was 21 years old. It's quite well done to have your own business at the age of 21. The shop was on number 2, Borgergade in Silkeborg. Unfortunately, she had it for only four years because she was cheated by her assistant who looked after the business while mom took some time off after my birth. And the economy was not yet safe. Well, maybe she would have sold it anyway to be at home with me. Day nurseries and kindergartens were not common then. And frankly, it was not her dream job. She never wanted to become a hairdresser. She was a pretty lass, though. No wonder my dad fell for her. Here we go again - unfortunately. Have pity on me. European Handball Championship for men will begin today and will end in about two weeks. It is a long time, it bores me. I know that Matron will watch all that she can and unless I leave the room I'll have to watch it too, albeit with very little attention. Handball will be on the screen from mid-afternoon till mid evening - every day. Phew. Well, never mind. Not long time from now (27th February) the spring classics in cycling will start, and it's my turn to sit in the front row. I am looking forward to it. I've enjoyed myself very much during the recent days. 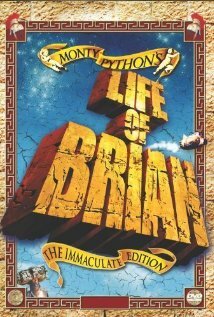 By chance I discovered that DR2 rereleased Monty Python's "Life of Brian". I recorded it on video on Christmas Day and have now spent a couple of days rewatching it. The first time I ever saw it was in 1980. Later, I used it in my English teaching. Besides I watched it now and so it's not too much to say that I know it by heart. It is for me the funniest movie ever made. When I first saw it I fell down the cinema chair laughing. Daughter Annette was there too and she found it very embarrassing that her dad was sitting/lying on the floor screaming with laughter - even when everyone else had stopped. It is impossible to say what I think is the absolute funniest part of the film. All scenes make me laugh. Even today. I've just finished watching it, and it will not be erased. Last night my sweet wife and I were the church in Tved on Mols to hear a lecture by former mayor Vilfred Friborg Hansen. 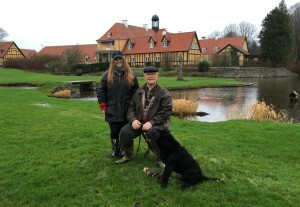 He has just published a book on Møllerup, the estate where I now for 40 years have taken part in nearly all hunts. I got it as a Christmas present. We were there with a couple of old retriever friends who also know the place. It is a well written book with a content that deeply interests me for two reasons. Firstly, I am generally happy all learn about our history and secondly I have known and know the owners and staff through 40 years. 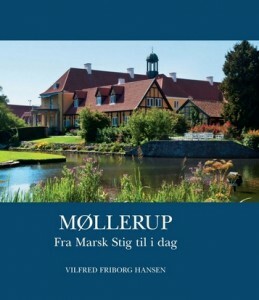 And not only does the book tell about Møllerup's history. It also tells of a troubled time in Denmark's Middle Ages with many rival kings and and nobility. And it was here that Marsk Stig, one of the first owners of Møllerup, came seriously into the picture and was accused of murdering the king Erik Klipping in 1286. He was convicted and was an outlaw for the rest of his life. His guilt has never been proven though. It was also interesting to read about the latest 40 years of the estate when I was a little close to what happened. Again I nervously had to have my Toyota hospitalized. She was smoking too much. At least that was what I and a junior doctor thought last week whenI was at the hospital for a preliminary survey. Moreover the car had nearly stopped smoking during recent days. Nevertheless the fear of another huge bill remained. I have still not recovered from the cost of the four valves a few weeks ago. My heart was therefore in my throat when the Chief Physician called at 11 a.m. to give the results of today's thorough examination. Fortunately it was yet another disappointment that did not come true - and an expense that definitely was bearable. My sincere thanks to The Toyota Hospital and its staff. I shall send the money soon. I was at the recycling center today. It happens too often. Never mind. People with big consumptions can not avoid it. 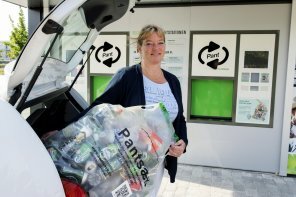 At previous visits I noticed that now one can get rid of beer- and soda cans there and get money for them even if they are without a deposit. At least I thought so. I followed the somewhat complicated manual on the machine and after some difficulty I got a special bag out of it and filled it with all my non deposit cans. There were about 75, and I was looking forward to getting money for something that usually gives nothing. Again, I studied the manual - and in went the bag. Big trouble. "We can not accept your cans," it was said on and on. So no money for the old man. Reason: I had crushed all cans. I always do. But we hadn't got a penny anyway. 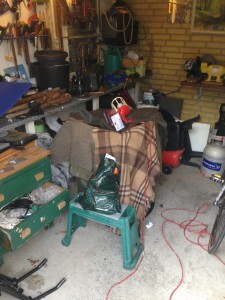 Again, after some difficulty, I got hold of the bag and emptied it at the recycling center, as I always did. It has been a joyless day. Forget all about summer holidays, old man. PS: I do not know the young lady on the picture. I love a good brunch. That's what we had this morning. 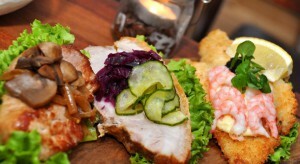 As a birthday present, I got a brunch voucher for "Cafe Kik" in Silkeborg. Today we used it. The cafe is located right on the river. In fact, in the middle of the city. Granted the weather was not impressive but perhaps you'd imagine the photo in summer colours. 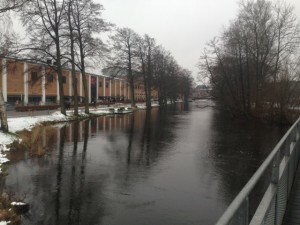 Then you'll see Silkeborg at its best. The cafe is located in the background on the left side of the photo. The food was excellent - and there was enough of it. Exactly in my spirit. Not surprisingly, I ate too much. So we saved lunch. It's becoming a habit. 4 days in a row I got up at 7 a.m. to take Matron to work. I am doing it because she is not fond of driving in the dark and on snowy and icy roads. My performance is enhanced by the fact that 3 of the 4 days I have not gone to bed again when I got home. This has led to surprising results. I put two identical door handles on the door to the guest toilet. The pressure from Matron was too great (see Diary 29th Dec, 2015). It took unreasonably long time since it was more difficult than I thought. I had to use several self-invented tricks. I am famous for them. My office is now tidy and has everything in place. Not a speck can be seen on the desks. Not since Christmas 2014 has it looked like now. I have sorted photos, especially those to be included in my upcoming book. It is a slow process. But very interesting. It is said to be healthy to get up early. It lacks evidence. It was a good day. I have looked after Frederik most of the morning until around 2 pm - all on my own. We enjoyed ourselves with a lunch of Coca Cola, crisps, chocolates and a single lollipop, all from the top of the food pyramid. In addition, we watched a DVD, a crazy cartoon about a race car named McQuin. We watched it twice - and we've talked, talked a lot, and then a little more. Maybe I should correct it, Frederik talked. But I love his tirades, and fortunately he occasionally stops and listens. 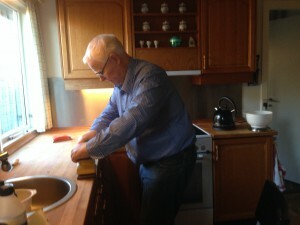 The day ended completely on top as granddad managed to repair a small electric train that didn't work. That gives bonus points. Just these days a lot happens in the professional cycling world. Riders change from one team to another. For some it is a "promotion" to others a step back . 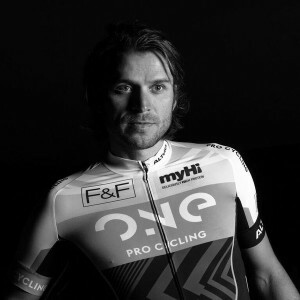 My friend Martin Mortensen changes from Danish CULT to English ONE Procycling, a clear promotion for him to a stronger team. I am happy on his behalf. The move has been reported in the cycling press and was signed before it became clear that CULT would shut down. But no one at all has taken note of my move. I have changed to the same team as Martin. Only nobody noticed it in the press. Well, I have not been particularly good this year. 1.907 kilometers I rode. Much too little. Martin is probably on 30,000 kilometers. But I shall come back. One thing is for sure, though. I shall not be in the Tour de France this year. My basic form is too bad. I had to fight hard this morning - as so often before. I had to get up out of bed, an activity that I do not care much about. It takes a stronger man than I and I have hard difficulties to persuade myself. 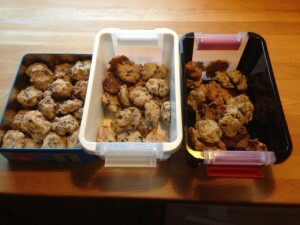 But I succeeded, after all, after a good hour or - sort of. I know it is not praiseworthy, but the advantage is that I can have lunch right away. And sometimes I have a good laugh, anyway. I had my fresh cheek colour back today. I can not believe I dared. I went for a walk with the dogs wearing winter jacket, cap, large scarf and gloves. Still, I was freezing like a little dog in a thin cord. I tried to increase the speed, no success. The old carcass has its own speed that it does not deviate from. I tried to beat my arms hard against my body. But still no success. The cold bit in my cheeks and ears. I decided that not until the day when the wind settles will anybody meet me walkiing. There are limits to what one can strain one's luxury body with. Obviously Christmas snow will come now, two weeks late. We can hardly avoid it. See weather forecast for the current week on picture. Snow, cold and not least arctic wind. I was not born to weather like that. Now I have to get up devilishly early to run Matron at work. She hates driving alone in snow. Now I have to sprinkle salt on a regular basis. Now I'll be wet and cold when I walk the dogs - or go outside at all. 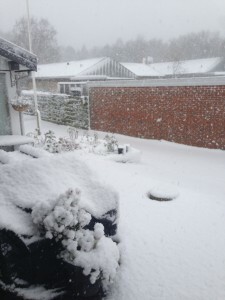 The only good thing is that grandson Frederik loves the snow and sledge rides - and that last summer, we spent 25,000 kroners on extra insulation in the attic. Weather is awful today. Temperatures are a few degrees below freezing and a minor hurricane is blowing. If you do not absolutely have to go out then do stay in. I went out and had a cold shock. I have read that with the wind we are having the temperature is like minus 21 degrees. And I am with a giant cold that really needs care. And I get none of it. All Matron says is: "Stop that moaning." It is difficult to put up with. One will sit back with a feeling that one is a nuisance, in the way and preferably should disappear. But she can forget it. I will not do it. At least not until my cold has gone. It has hardly escaped anyone's attention that Prince Consort Henrik has retired. The Queen said it herself in her New Year speech. But apparently he will continue claiming his usual 8 million kroner per year without doing anything and apparently he keeps his title. When I retired in 2005 I lost more than one third of my salary - and my title. And Matron made sure that I did not have less work to do. That's how the world is - not always fair and logical. I slept a little longer today and did not understand that Matron had not yelled at me a lot before. But she couldn't. She also slept - at least till about a little over 11 a.m.
Of course I immediately jkumped out of bed to perform the usual New Year day's commitment, reading the water meter. That should be an easy task but it is not. 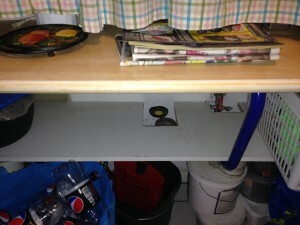 The meter is placed under a table in the utility room. (See picture). I had to get down on my knees and maneuver of my body in between the top and the shelf using a torch to read the meter which can only be done from a position vertically above it. Damned inconvenient. Next comes the hardest. I need to stand up. That's a struggle. 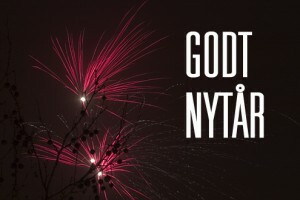 Do not say the first day of the New Year is a day of relaxation. Buuuut, it may well be a good year anyway. First of all I would like to wish everyone a Happy New Year with thanks for your interest in my website in 2015. The year was in many ways a special year. It was the year when we had a lot done around the house. It was quite expensive but very nice. 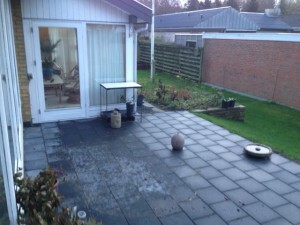 I am particularly pleased with our new terrace which I daily look at with great pleasure. It was also the year when our car cost us a bit of money. It was quite expensive but appears to be well spent. It was also the year in which my number of bike rides was disappointing. 1.855 kilometer it was in all. Last year I rode 3.240 kilometers. It's no good. I'm mad at myself with the result. It was also the year in which my site topped one million visitors. In return I am proud of that. Son Peter got a fright today, a fright that I can easily recognize. A lamp lit in the dashboard of his car. I have tried this several times in my car, often 3-4 lamps at one time. Every time I feel that the money was already pouring out of my bank account before I was even near a workshop. Within the last year, my fear has been justified. The Toyota has cost quite a bit of money. It has not been any good. Many lamps lit much too often. But fortunately there are disappointments that do not come true. 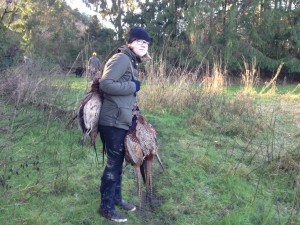 Son Peter today experienced one of them. Only 300 kroner was the price of 'stopping' the light. After that you breathe a lot lighter. It's like leaving the dentist without him drilling - maybe even better. 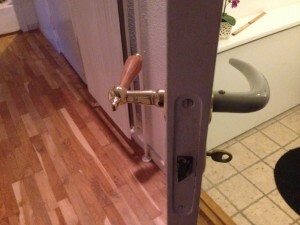 I have repaired door handles today - 2 pcs. One to the guest toilet and one to the living room. I am no great technical genius but I think it went fine. However I might receive ironic comments concerning one door, the toilet door. But this is not fair, it's merely trifles. Who says that two handles on either side of a door must be identical? At least I don't. Do you see anything basically wrong in the picture? Most important is that it works. And it does. Matron has not yet discovered it and it may take quite some time before she does because she rarely uses the guest toilet. So please do not mention it to her. I do not want to be yelled at today. It is our 53rd wedding anniversary. So today should be peaceful. For a long time we have benefitted from falling petrol prices. In the entire world. Right now the official price in Denmark 10.69 kroner per liter, and falling. But listen. 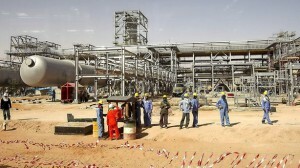 In Saudi Arabia, the world's largest oil producer, prices are rising and are now expected to increase by 40%. If it were in Denmark we would have to pay 14.97 kroner a liter, Denmark record. But in Saudi it will mean an increase from 1.02 kroner per liter to 1.43 kroner per liter. It is probably also a national record. My goodness. It's a long time since I last appeared as a dog trainer in the training of a young dog. It was Peter's dog, Tjalfe that had to get used to shots. Oddly enough one starts with a "dog stopper gun". For some dogs it can be an unpleasant experience. They become frightened and try to run away. It is said that the dog is "gun-shy". The consequence being that it can not be used on a hunt. Fortunately Tjalfe responded positively and just raised his ears when a shot went off. That's how it should be. After that we concentrated on some technical details. Also successfully. It was a good day with a good dog. The irrevocable last hunt this year was today. It was wet - very wet. But it takes more to make me think that it was "annoying". As always I enjoyed it. 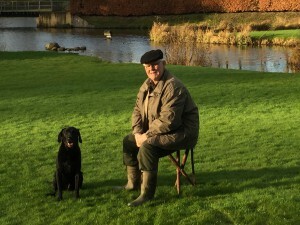 As shown, eldest granddaughter Katrine was with me among others to help mecarrying pheasants, carrying my chair and taking care of my faithful dog Sydney. She is good at. Now there are 9 months and 3 weeks till we shall retrieve again. At my age one does not wish that time will go fast but I am looking forward anyway. There is a hopefully good summer between now and then. It can be hard to pinpoint one's most popular Christmas gift. But I have no doubt as to which of them will arouse the most attention. My Christmas sweater. Katrine bought it for me in London last week. Therefore I wanted to test its efficacy in a supermarket. I gott the opportunity as matron asked me to buy one small thing on the way home from Hammel where I collected granddaughter Cecilie. A supermaket in Skødstrup was chosen for the experiment. As expected, there was interest. Never before have I seen so many people stop and look when I passed. Most people smiled, while others shook their heads. Of course I didn't react. But what a nice Christmas present it is. Maybe I should put it on when I go on the hunt tomorrow. That will be the sight. I hope that all of you will get a bunch of big and good Christmas presents and that you will have a beautiful Christmas Eve and day in good company. I do not know myself about my gifts' size or quantity but I know that I shall be in good company. The entire closest family with children, in-laws and grandchildren will be here. I am looking forward to it all. Here in the family, we have the habit of eating Christmas dinner at 1 pm. Then we go for a walk, come back, dance around the Christmas tree - and exchange gifts and then the candy department opens. All this will be over about 7 pm. and there is time to rest and digest. For those interested there will be a "midnight snack". Open sandwiches or the like. For us it gives a much calmer Christmas Eve. And the youngest can be involved throughout. It's all before their bedtime. But whether you are celebrating your Christmas early or late, I wish you a really good one. Like mother - so daughter. Only in a slightly higher degree. I had promised daughter Annette to run an errand with her. She had to deliver something a little outside Hornslet and her car was not in - and it was pouring. It became something more. Besides delivering the above mentioned outside the town we went to five supermarkets, a bank, and a flower shop. Not even matron has done that. Not a supermarket in Hornslet was unvisited. Righteously it should be mentioned that the visit to the bank was my errand. Now I am at home and trying to recover. 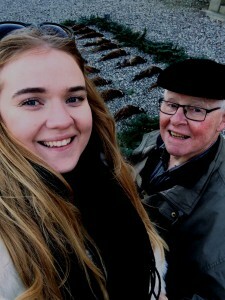 It's hard for me because in 10 minutes I also have to pick up eldest granddaughter Katrine in Aarhus. 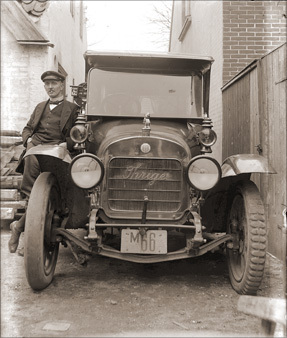 Long live "Gunnar's Taxi Company". It is the shortest day of the year, 6 hours and 54 minutes here with us. Sun up at 8:46 and down at 15:40. At 5:48 this morning the sun turned at the Tropic of Capricorn and began its journey back towards us. Have a nice trip. The fact that it is now going "the other way" is nice. Every morning when I wake up I shall with gratitude be looking at my "world clock" and note that days are getting longer again. It gives a good feeling. It makes one looking ahead to warmer days even if one can not claim that we are having a cold winter. But a day length of 6 hours and 54 minutes is not much. It will be more fun when it's over 17 hours in June. It was difficult to get up at 7 this morning. It was hard. But I had to. Emptying the dishwasher, which I did first, and then walk with the dogs. Not much, but think of the time. On my return after the walk I felt an uncontrollable urge to lie down again. I lay on the bed and set the alarm clock to wake me up at 11:30. That should give me time enough to pick up Matron. But when the alarm sounded I could hardly persuade myself to get up. I had to really use harsh words before I succeeded. Second resurrection is harder than the first one. Good teamwork in the kitchen today. 6 pheasants were cleaned. I cut off heads and opened the skin into the breasts, and Matron cut them out, red and fresh. Altogether, it took just 20 minutes, and thus the menu for New Year's Eve is secured. 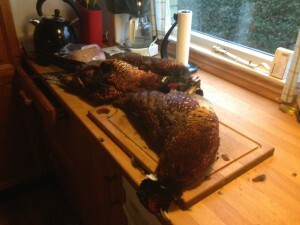 By that time the good lady will unfold her magic and prepare the pheasants after a good recipe she got from old friends many years ago. It never fails. The result is absolutely wonderful. Now I just hope that I can take a single glass of red wine with this good meal without falling asleep. Youngest grandson Frederik briefly joined us on the shoot today. I guess you can not start too early. I was 35 years old when I was on my first hunt. 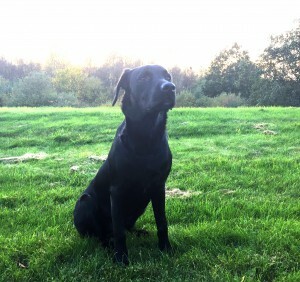 Frederik is 3½ years old. So there is a difference. 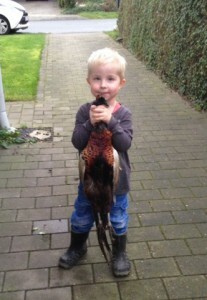 Arrived at home he could help grandpa carrying the pheasants in from the car. 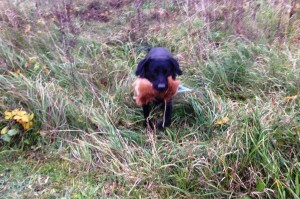 Unlike many other children, he has no objection to carrying a pheasant. And according to good hunting practice it must be carried head up. Well done, Frederik. Next year you must come more often. And I have to take one more hunting season even if I have considered stopping. I shall be looking forward to the season of 2016 with Frederik by my side. Then I have been retrieving with all four grandchildren. That will be great. I have been messing around in my old photos again. I am looking for material for my book. 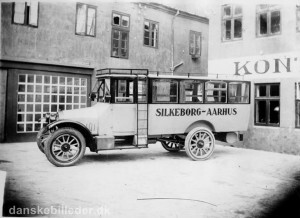 Today I came across a picture of my Dad taken in Silkeborg in 1921 - undoubtedly by a "street photographer". The family did not own a camera. It is 94 years since it was taken. 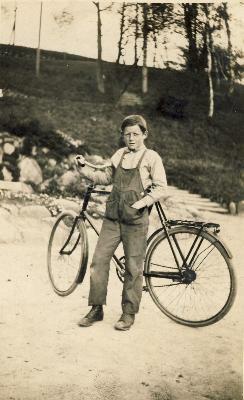 He was 10 years old and stands with a bike that's probably not his. It is far too big for him. And there was no money for it. Probably it's borrowed for the occasion. I think that the clothes he is wearing are "Sunday best". Notice that picture was taken three years after the first World War ended. It was the year Albert Einstein received the Nobel Prize in physics. 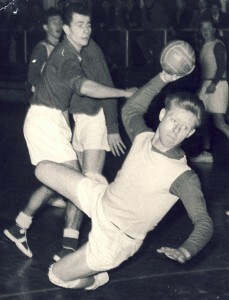 It was four years after the Silkeborg Sporsts Club was founded. Many years later - around 1956 - my father became chairman. For the sake of the locally known I can tell the picture is taken just at the harbour. At the top of the hill behind is and was the hospital, which in 1921 was 19 years old. I was in Billund this morning. Not to visit Legoland but to take eldest granddaughter Katrine to a flight to London. She wants to do some Christmas shopping and visit selected sites. Fortunately I am not envious. Oh no. But I would not have minded going with her. 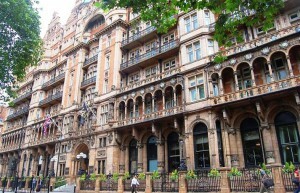 Nor am I envious that she will stay at a super nice 4-star hotel in central London. Oh no. Am I envious that she will visit some of the places I love, for example, British Museum, Tate Gallery? Oh no. Do I speak the truth? Yes - weeeeell, almost. Matron was up early this morning. She had to on the job. I was relaxing in my good bed. I felt a little peckish and shouted to her that I wanted tea in bed. The answer was a clear NO. So I shouted to her she was an old penguin that ought to be stuffed. Then she yelled back I was an old fence that highly needed some paint. That really tested my tolerance? So I pulled my trump card and shouted that I wanted a divorce - immediately. And do you know what she allowed herself to shout back? And that's how this morning went with its usual exchange of evils. It's not easy to be me. 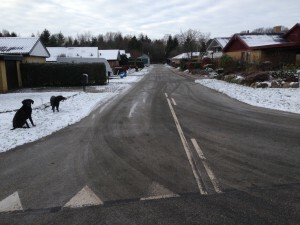 I drove peacefully along Grenåvej in Risskov this morning to drop off Matron on her job. She is so sweet to make sure that we can get butter on the bread. Suddenly my eyes catch a price tag at a gas station, 7.45 kroners per liter of diesel. My jaw dropped. I have not previously seen it so low. Therefore I hurried to drop off the sweet lady and then sprint back to get refueled before the price would rise again. I succeeded and my tank was filled to the brim. Unfortunately, it was only half empty. Anyway, I saved an entire 18.75 kroners. Little is better than nothing but it does not save my finances. Diet here and diet there. 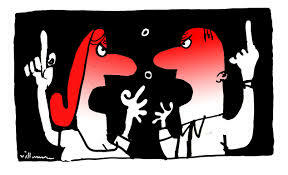 What good is it that you once a week decide to reduce the intake when you constantly are tempted into trouble? Thus also today. 75-year birthday with old friends and as usual, a table laid with very nice dishes. It was hard to decide what was best. A shrimp cake with among other things caviare and a salmon and halibut salad on apples were nice. And then there were all the other delicious dishes. What is one's promises of lower consumption worth then? Absolutely nothing. Basically it is unfair that the hosts - when they know that my spine is like cooked spaghetti as soon as I sit down at a good table - to serve a meal like that. When my grandchildren join me on a hunt they are expected to work and among other things carry the pheasants my dog has retrieved. 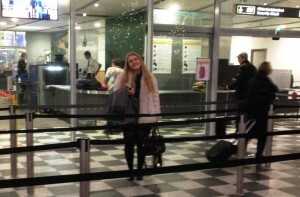 It is expected and Cecilie was not slow to take on the duty. I have enough trouble walking without pheasants. They can actually be quite heavy. With Cicilie carrying I can sit peacefully thinking about the world's many ups and downs enjoying the surroundings and what is happening around me. Excellent division of labour. Today's hunt was great in every way. It was worth getting up early for. Weather beautiful. It has been the annual Great Baking day and Great Marzipan day today. Just the thing for me. All morning Matron and granddaughter Cecilie have been in the kitchen baking "Chocolate Nuggets" and made marzipan in various forms. See pictures . 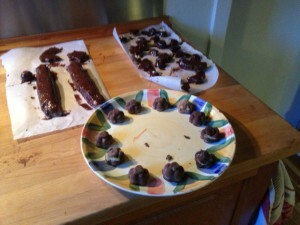 Unfortunately, the marzipan is not quite finished missing nuts and another layer of chocolate. This will come. I am pleased to say that nothing is missing in taste. Graciously I have been allowed very few bits and pieces, much too little. The two women both get a fit of stinginess when this day arrives. And they do not leave the kitchen both at once. Wonder why. I was in Silkeborg today, partly to visit my sister in law who celebrates her birthday and partly to have some old photos scanned for my book at the Silkeborg Archive. I have learned that digital images for books need high pixel figures which my own amateur scanner can not match. The archive scanner can. As always it was great to come to the Silkeborg Archives and talk with the helpful people there. And there is always something new to pick up about the old days. Besides the pictures I brought along I recieved a good deal from the archive. See an example here to the left of the two barracks which were part of the homeless institution (1960). 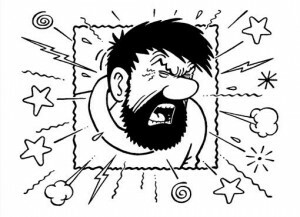 So now I should be well equipped wiith illustrations and just need to have them put in at the right when I receive them in January. 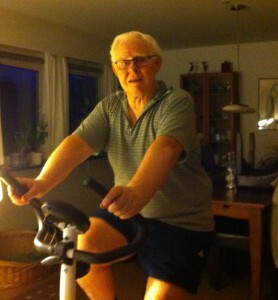 Today my indoor cycling season started with a modest ride of 25 minutes. 2015 has been a miserable year in terms of cycling. I had even set this year's target down to 2,000 kilometers and I have not reached it. 1.855 kilometers is the meager result. 145 km missing. I am disgusted. Last year I rode 3.115 kilometers. Let's look at the excuses. The most important is the weather. Too much rain and wind and a cool summer. These parts do not encourage a bike ride. 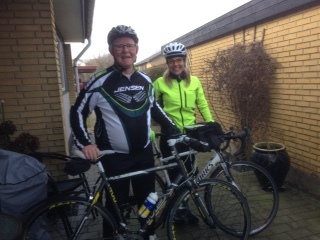 I missed the long rides with my Brother Kjeld. There have only been a few. Reconstructions in the house and changes in the garden prevented me from getting out. Continuous defects on the bike annoyed. 1. Standing poised on an unsecure ladder pulling a wet and heavy canopy off a wet caravan and store it away for winter? 2. Climbing up on the garage roof on the same ladder changing batteries on the rain gauge? 3. Taking a walk of 20 minutes with Matron and the dogs? I've done all three today and I am not the slightest in doubt. Number 3 is far the hardest. I suffered all sorts of pain in my hip. So I must more seriously consider the damn diet. And that is harder than anything else. I was in two charity shops today in search for a cheap, second hand suit jacket. There were plenty of very nice jackets for sale. Practically, it could not be seen, they had been in use. But why is it that there were only children's sizes? Is it only the young boys who submit their jackets to charity shops? Are there no adults at all? Apparently not. Not even one of the exhibited jackets fitted my well shaped body. That forces one to spend an awful lot of money in a clothing store (or tent factory). However I shall not give up as yet. I shall keep looking. There must be a second hand shop for adults somewhere. We did manage to buy a Christmas tree. Not second hand, though. A bit more nostalgia. I love that picture. It is taken at the old workhouse Frydensbjerggaard in Silkeborg in the summer of 1947 when it was no longer a workhouse but quarters for homeless people. Dad was the caretaker. My family and I lived there from 1943 till 1954. 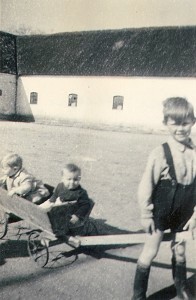 On the trolley is brother Kjeld at the rear and in front is cousin Joergen, both about 1½ years old. The tensile force is provided by me, 6 years old and wearing the indispensable wellies. We wore them all year round. The brace pants were also mandatory. The building in the background is the old barn of the work house, an outstanding playground with many challenges both inside and out. Among them was runring along on top of the roof. It took courage. And we were courageous. Did it often. It took more courage to say that one did not dare. I went to church this morning which I unfortunately do too rarely - but more than once a year. It was a good experience for mainly two reasons. The first was I got clarity with the parable of the 10 virgins of which the five went out to meet the bridegroom with extra oil for the lamps while the five others just brought lamps. Their light burned out, and they could not get into the hall. The first 5 would not share their oil with the 5 others. And here my understanding has failed since my childhood. Why didn't they share? It got the answer. The oil should be compared with something you can not share, being present in your life, live committedly, be impathetic. Then you can come to the party, be admitted. Call it 'due diligence'. The second reason was more "special". At the start of communion the vicar hopelessly got stuck when giving the blessing of bread and wine. Something must have slipped her mind. Without any doubt she has recited the text hundreds of times. But she was calm, smiled to us, turned quietly around, took an open book, looked quickly and completed in fine style. Others might have paniced. I was happy when I left the church. I've got a tough future ahead - at least for the next 2 weeks. World Championships in women's handball on TV. Matron loves to watch it so it will be 3-5 hours each day. She has a glorious past as a player herself. I have not, even though I played a lot in my younger days. But handball bores me tremendously. Furthermore, it irritates me a lot that so many fouls are not detected by the referees, especially players standing on the floor three meters inside the box and shoot. An ordinary "stepping on the line," is very rarely detected by the referees. But worst of all is that handball is one long running up and down the field, then bang and then down into the other end and another bang and then down into the other end and bang ........ and so on. I am in the nostalgic corner today. There is a side of myself that I had almost forgotten, at least till today when I came across the attached photo from 1975. I was once mad about fishing. Since I was a boy, I fished when the opportunity was given. 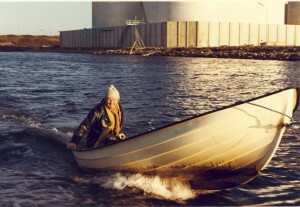 I started fishing with my dad in the river in Silkeborg and later it was on the Bay of Aarhus - without Dad. I also spent many many hours at various small and large rivers, at various beaches and the outer pier in the Port of Aarhus. It was here I gave son Peter the very first small ideas about fishing. Since then he has overtaken me by thousands of kilometers and he fishes a lot more than I ever did. I stopped fishing around 1975 when I started going hunting. And actually, I have not fished just one second since. 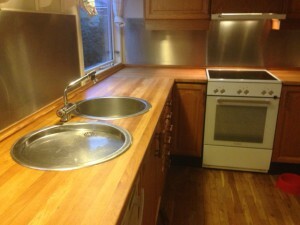 Today it is exactly a week since I started the enormous task of cleaning, sanding and oiling our kitchen tables. I worked on it every day since then - except Saturday though (hunting). Now, they stand there. Finished. Glossy and shiningly clean. The surface is like velvet. So now I want to rest on the success. Because I deserve it. I took Matron to the dentist today. Tooth extraction. I had offered to pull it for her, of course expecting a modest fee. But no, no. She insisted on spending 900 kroners on the pleasure. I sat comfortable in the waiting room - see picture - and awaited cries of pain so that I, like the valiant knight on the white horse, could rush to the rescue. But no screams were heard. Everything went well. Now I have to live with the fact that the poor woman can hardly speak because she has to bite on a cotton pad. Nor can she eat so I probably must do the kitchen job myself. It won't be a big meal. Damned dentists. They are expensive as hell and they destroy much of one's pleasures. I nearly cannot believe it. I do not care very much about my football team AGF. After happily having waved goodbye to Gorm the Storm I found it in time to finish grinding our kitchen table. Surprisingly it was an exciting job. In fact, I have never tried it before, at least not as thoroughly as now. I estimate I spent 10 hours on it all in all. I even think I enjoyed it. Now the table is ready for oiling and a clever paint store man instructed me how to do it. "It can hardly go wrong," he said. But he doesn't know me. We are ready to receive Gorm, the name of the storm that is predicted to visit us. According to our usually unqualified meteorologists Gorm will be with us between the hours 10 p.m. and midnight. He is utterly unwelcome, a storm with built-in-hurricane strength always is. We have removed all loose parts from our garden and terrace and placed them in our conservatory which right now is storeroom for garden furniture, barbecue, flowers etc. Oh dear. I am a keen fan of the TV series "Fawlty Towers" with the mad hotel owner Basil Fawlty (John Cleese). I've seen it countless times and I laugh nearly just as much as the first time I saw it some time in the 1970s. The characters are unique, the mad owner Basil, the "stupid" waiter Manuel from Barcelona, the drunken chef, the snobbish Mrs. Fawlty, the cute receptionist Polly and a lot of guests who all get a lousy treatment not least from Basil. And now they are going to tear down the hotel in Torquay. It should be "Fawlty Tower's Museum". A little respect, please. It's "Black Friday" today, an almost pagan custom. In Denmark we took it upon us in 2013. Bargains and late closing times are major parts. No surprise that the custom originated in the USA, introduced first in Philidelphia in 1961 by business people. They wanted to celebrate the opening of Christmas trade. Since then "Black Friday" has been the greatest shopping day in the United States - and it will soon be in Denmark as well. The origin of the name. Business people felt that they earned nothing during the first 11 months of the year. But starting from "Black Friday" the revenue turned and the bottom line became black. Well, never mind. Let's take it. We already have "Valentine's Day" and "Halloween". And "Thanksgiving" is on its way, too. Influence from the United States can not be denied. Only I do not want to participate. I finally found out how to get a for 30 years linseed oil saturated, greasy, massive kitchen tabletop made ready for sanding. I'll spare all details but simply tell that it involves the use of turpentine, deterent, luke warm water - and kerosene. The latter took care of the main problem removing the greasy layer. Now I "just" need to sand the table top. It will take a few days to really get to the bottom of the grease. Today it took me 3 hours to sand the plate for the first time. A good deal more times are to follow. My old back thinks it's a damn bad idea. Matron is thrilled. Workhouses still interest me. 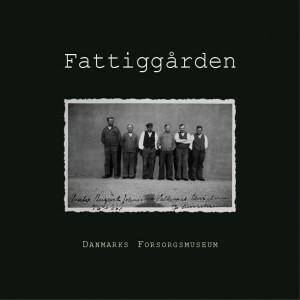 I like to read about them, even if it is five years since my own book about Silkeborg Workhouse was published. Svendborg Workhouse Museum has published a book, "The Workhouse" which I bought today. It has been well recieved and I am looking forward to reading it. I have just managed to see that it is well illustrated with relevant photos. I have visited the museum a few times and would recommend that if you're at Svendborg then go and see the museum. It is interesting and gives an excellent impression of the paupers' hard conditions. The workhouse at Svendborg was in function from 1872 to 1974. From 1961, however, it was voluntary to stay there. It was a so-called care center. It is the only workhouse museum in the country. Christmas has started here at Stenvendervej. Today Matron ordered me to put lights on the Christmas tree at the front door. It was not a negotiating proposal. It was an order. Therefore I had to bite the bullet and go outside in the freezing, cold wind and carry out the order. 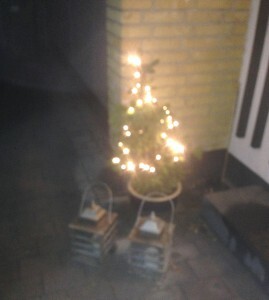 I'm not much for lights on Christmas trees outside the door and, in particular, I am not much for cold winds. Moreover, I find it inappropriate to put lights on Christmas trees now. It is more than a month till the event. It seems to be Christmas all year round. But who dares standing up against Matron's power? Not me. A mixture of 1 liter of boiling water and 1 deciliter of turpentine does not smell very nice. However, it is good for washing off a wooden, greasy kitchen table. That's what I've been doing today. A sound scrubbing, really thorough, with the mixture mentioned hopefully removed all fat and old oil from the table. I have now rubbed it off with a dry cloth to make it dry. After that washing with a detergent and some lukewarm water should remove the last remains. This followed by grinding and smearing with oil will hopefully give a good result. I'm loking forward to that. A Sunday in snow. A Sunday on the sofa. Today's assignment was resting after yesterday's efforts on the hunt. I have not burned many calories today - if any at all. In reverse, I have taken a lot of them in. Cocoa, cake, fritters and so on. No wonder I do not lose weight. On the other hand, I have enjoyed myself tremendously and dozed off a couple of times. Amidst all the 'rush', I took time to run Matron to a Christmas market. So I was a bit useful. But that was all. I should also mention that my old dog Sydney, 11½ years old (right in the first picture), has got his second youth. He runs almost like in his younger days and finds many birds. Corticosteroids are good for an old dog. I also considered taking them. I have damned difficulty in dragging myself around in the terrain. A good day yet again. Unlike yesterday, I have not been swearing today. There has been no reason for it - and then, still. My mad son arrived before sunrise and made the hell of a noise, nudged me, and tickled me and I had not even left my warm bed. He calls it "playing with Dad." I might have said a few nasty swear words, but I didn't. You have to be careful what we say when your children are nearby. They easily learn to use ugly words. And I don't want be to blamed for teaching my children that. The rest of the day has been a pleasure in a relaxed atmosphere and nice chats with Matron. I am a bit ashamed to tell that I know a few swear words. Not that I use them every now and then but it happens when something annoys me too much. Today my swear-word-vocabulaty was too small. 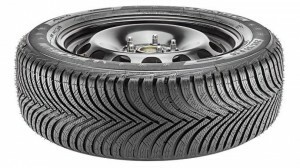 Matron and I left to go to our tyre supplier in order to change to winter tires that are stored there. The car was taken into the garage. I chatted a bit with the mechanic and soon after the boss himself came with my winter tires. I could see from his attitude that something was wrong. And certainly I was right. "Wouldn't you like to buy four new winter tires?" he asked. "Not in the least," I answered. "They're worn out," he carried on. Then the swear words came. The entire amount of them. I had to stop because I could not remember any more. Think of it. 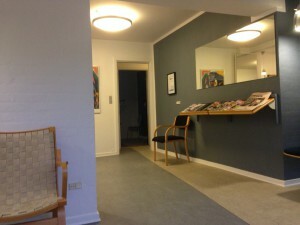 Matron and I had gone to vhange wheels for 400 kroners and suddenly the bill was 4,300 kroners. My goodness. How I could swear. I even threatened the otherwise nice man with a sound beating. Give me just one word of comfort. One became 75 years today. Who would think it could be achieved? At least not I. But it is a fact. It all started on November 18th 1940 at 05:00 a.m. at 52, Skolegade, 3rd floor in Silkeborg. I do not remember much from the event. But it was for me quite important. After much deliberation my parents decided that I should be called Gunnar. God bless them. I have not always been excited about the name but gradually I got used to it. And now I will not bother changing. I'm not the only one who celebrates a birthday today. Many other celebrities share the experience with me. Let me mention a few: 3 famous Danish authors - and Peter Schmeichel. What do you think about that? I wonder if they've had as good a birthday as I have. It's over - completely over. I mowed our lawn for the last time. Hopefully not the last time for good but the last time this year. It was a good experience to stop the engine and have the mower flushed underneath for old grass. Now it can enjoy the winter holiday with a clear conscience and await better times as far as weather is concerned. I'll enjoy sitting indoors in a comfortable heat watching the grass not growing. It will last until April - hopefully. Last year I mowed the lawn on 1st of January. 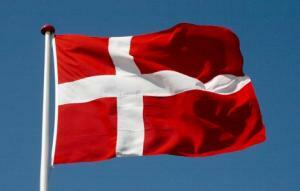 After all it has not escaped my attention that Denmark tomorrow will play a crucial football game against Sweden. It is a qualifier for the European Championship in France next year. 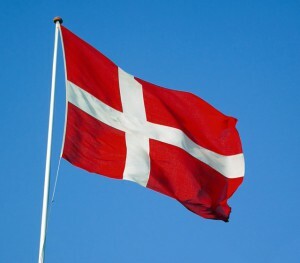 Denmark must win to qualify. 5-10 years ago a game like that would have been on my mind many days before and my nerves would have been nearly unbearable. I would have watched every second of it on TV. Now I'm a more or less indifferent. It's fine if we qualify but if we don't then peace be with it. It's not that important. It's just football. It is surprising that one's field of interest moves that much with age. For 45-50 years I watched as much football I could overcome. Now it is almost a rarity. Youngest grandson Frederik has stayed overnight with us. That is popular. It is a tradition that he and I go to the beach and throw stones into the water and do other maritime exercises. It is also a tradition that I get seriously scolded when we get home. 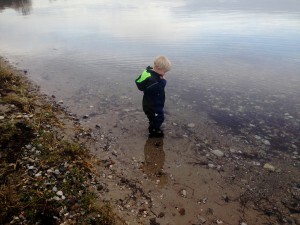 Reason: Frederik has water in his wellies and wet pants. As if it's my fault that his boots are too short. As if it's my fault that he loves running and jumping around in the water. "Let the child be happy", I say. Undoubtedly the big experience of today was being visited by nearest family. All were summoned to celebrate an upcoming event, my 75th birthday. I was also there even if I'm not on the picture. I took it. I love it when they're all here and I can listen to their talking and laughing. As usual lunch was excellent, everything made by Matron on a busy morning, assisted by granddaughter Katrine and myself. I do not want to celebrate my birthday with a mighty party. I care more for the quiet and intimate. Then I am comfortable. Have you ever tried falling face first? Hopefully not. I have. Today. I was on a shoot and was walking all alone on my own on my way back to the others. I walked in tall grass. It was late in the day. I was tired. Just as I walked looking at the dogs my right boot stuck and I fell forward like a log and hit the grass face first. First I felt the wet and soft grass. Next, the hard ground. I was happy about two things. 1) There were no nettles. 2) No one saw it. I know all too well the consequences. Laughing stock the rest of the day. When I somewhat later came back to the others, they said that they had been concerned about my absense and were about to collect for a coffin bouquet for me. They are cute. As indicated yesterday today was the day of mega shopping. 4 supermarkets and two farm shops have made their terminal accept our credit cards. You need a good health to cope with a day like that. Luckily I only had to join Matron into half of the shops and could peacefully sit in the car concentrating on playing Word Feud on my iPhone. It turned out to be quite a lot of games - and also Facebook needed attention. Now, our fridge and freezer are full to bursting. Barely space for a can of Pepsi. Fortunately I am going to help eating it all. I choose to forget my diet. I have done that since February anyway. This was my view most of the day. 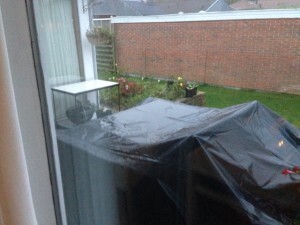 A look out on a wet and grey day, at our garden furniture under cover. Like I they are looking forward to being unpacked in the spring. And our packaging is approximately of equal in size. But now you should not think I've been wasting time. Not at all. I had a nap two or three times. I watched a bit of TV. I played Word Feud. I had lunch which I made in good cooperation with Matron. These are all good and Christian deeds. Therefore, I feel good about a lazy day now and then. I deserve it and almost feel rested. Tomorrow will be a different kettle of fish. There is shopping to do. Announcement to all supermarkets in the region: "Roll out the red carpet. She is coming." It is St. Martin's evening today. Thousands of ducks and geese are killed because the good Martin who lived over 1,700 years ago did not bother becoming a bishop. 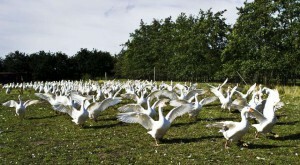 He therefore hid among the geese that - unfortunately for him - piped up and he was found and appointed. From then on he did not like geese. 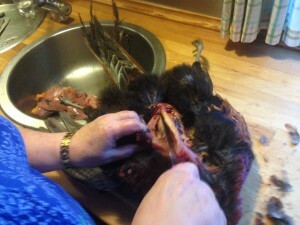 Consequently he decided that all households once a year should kill a goose and eat it. That would teach them. And here I thought that bishops were kind and forgiving humans. But no. Heads off the poor geese that otherwise were just walking around looking forward to Christmas. Later ducks also had to pay with their lives. It is so unfair. They had nothing to do with the unveiling. 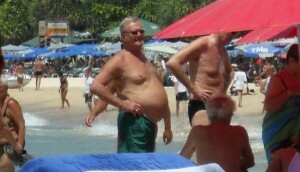 They are just less fat - and cheaper. I feel sorry for the poor poultry to be killed due to an unwilling bishop. So here in the house, we shall have a good soup made by Matron. Part of my morning was spent pottering around in my cozy and now tidy workshop. Cleaning up was made even better than it already was. Some repairs on some electric cables that needed it were done. I moved around cans, bottles, and tools to make it all look really nice. And finally I cleaned my bike totally after Saturday's lovely ride on wet and dirty roads. At the same time, the chain was cleaned and oiled. Oh man, how I enjoyed myself for a couple of hours. However, it was a little cool out there. I miss a heater. It would have made the experience complete. Lovely warm tomato soup for lunch quickly made me warm, though. Damn it. Tomorrow I may go out and move things around a bit again. I do not remember the last time I was as tired as today. I was and am tired all the way through my old body and out the other side. My legs weigh one ton each and my back is locked. I can barely move. The reasons for this poverty and misery lies in my two favorite hobbies, cycling and hunting. I have been so careless to think that I can do both disciplines on two consecutive days, Saturday and Sunday. Let me state in capital letters: I CAN NOT. Yesterday I cycled 63 grueling kilometers and today I have been on a strenuous hunt. We walked a lot more than usual. That mistake I shall never make again. There must be at least two days in between. 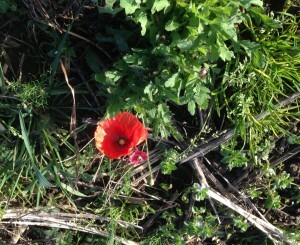 But it was great in the midst of all efforts to find a poppy in bloom. And we are in november. 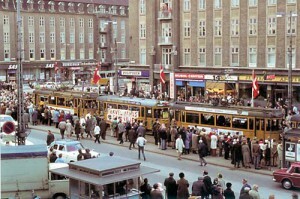 Today is a memorable day - not least for our daughter and Aarhus Tramways. 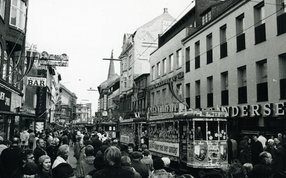 Sunday, November 7th in 1971, 44 years ago, our street trams drove their last tours. Daughter Annette and I went on a "farewell tour". We entered a tram and rode all the way to the end station and back again. Annette was 4 years. It was great for her - and little for me, too. Unfortunately I do not have pictures of my own from the event but fortunately there are many who have. One would like to see the trams back again. Maybe the future 'light rail' can be remove some of the thousands of cars from the city center. On a dull, gray, and dark November day like today I have no great desire to do much outdoors. So I have abstained from it. Nor have I had the urge to do anything indoors. So I have also abstained from that. Today's activities consisted of visits to a couple of supermarkets, picking up dog food and a visit to the car hospital to pay the large bill for the latest treatment. They were pleased and surprised by the payment. Today's activity has overall been manageable why I now sit fresh and rested looking forward to going out to eat with daughter Annette and son-in-law Kent tonight. 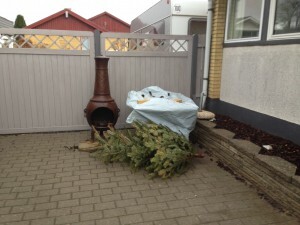 It is a reward to the two for having sorted the garden while we were on summer holiday. So you can not say that it is premature wages. Perhaps it will be with interest. 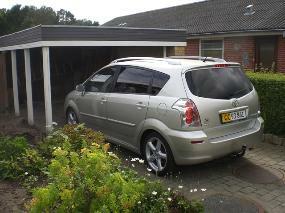 In 2006 our car was brand new. Now it is 9 years old. In 2006 I started my diary that you are reading just here. That is 9 years ago. AND. 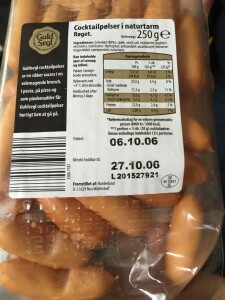 In 2006 the cocktail sausages that Matron bought 3 weeks ago at ALDI were produced. They were 9 years old. They are a bit overdue. See picture. Luckily, Matron noticed the error before we ate them. An inquiry in the shop was not taken seriously. Unfortunately the sales slip is lost. The lady cashier believed the sausages maximum were 14 days old wherever she got that from. And only reluctantly she paid the money back. A written request 8-10 days ago to the main office of the company is unanswered. I think we shall limit our shopping at ALDI. There are three ways of making a dog a good dog, training, training and training. I can not claim that I have used all three, at the highest one of them. Today, however, I took the time for a proper handling of both dogs. It is often the case that old dogs can not learn new tricks so I limited myself to training fitness and a little technique. Both dogs were very interested and surprisingly obedient. I am sure they enjoyed running around finding old, worn dummies with old worn red deer skins. Pheasants are more fun. They must wait until Sunday. The first time was boring. The second time was more boring. The third time was deadly boring. 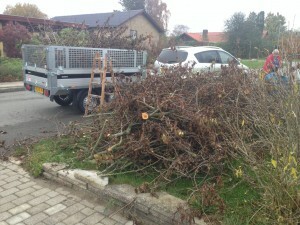 Three times we had to drive to the dump to dispose of the results of the powerful trimming of 1 pc. of plum tree and 1pc of red hawthorn. It took 3 ½ hours. We had rented the trailer from a local trader, gas station attendant, for the incredible sum of 175 kroners. In return we got a brand new trailer which drove its maiden journey with our clippings. That's something to remember. Matron, the tough woman, took her share of the job but now we are tired both of us. So I told her to have a small break while cooking. Not too long of course. I want her to feel feel that I am a kind man. The big clean-up craze seized me today - for real. My workshop which since last summer's many activities has resembled a bomb crater is now in good order. It took a couple of hours. 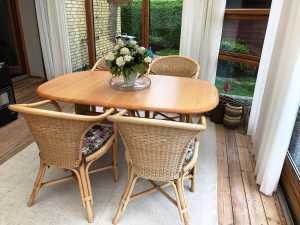 Now you can see the floor and table which has not been possible for a long time. 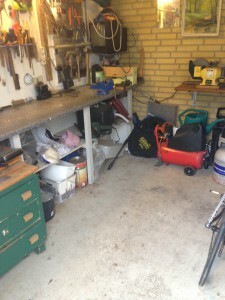 And there is space to move around without having to move compressors, bike, folding work bench, bike and repair stand. Nor do I anymore have to worry about tripping over some tool on the floor. The halo is hovering brightly over my beautiful head - and I was praised by Matron. Now I await to get the same desire to clean up in my garden shed. May it come soon.